Chaucer confesses that he is financially inexperienced. Willie barricades herself in the dorm. There's a surprise in store for Joan. I have corrected the misspelling "Chauffer"
Laundry muster call is for "Collins, Flynn, Kelly, Paterson, Brodie, Brizano and Kent" - I think Joyce means "Balzano" who is seen walking to the laundry behind Lou, Nora and Lexie - along with the two Les Dawson lookalikes. A stray Joyce Barry appears among the signatures. Willie comes round in the infirmary but seems to have lost her memory: she doesn't even remember her own name. The women think the attacker was Jacko (whose locker it was) ... but Lexie accuses Lou ... who accuses Daphne. 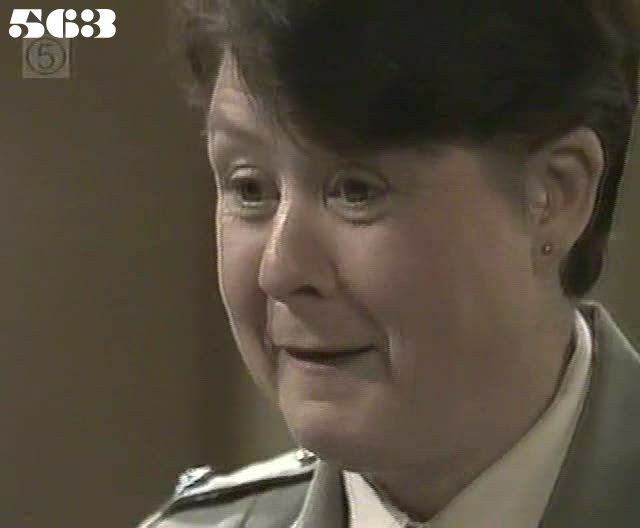 Joan suggests that Willie is faking and Meg makes the extraordinary statement that "if a woman suffers genuine memory loss then they cannot be held reponsible for their original crime". (excuse me? even if the memory loss occurs long after the crime?) Lou finds out about Lexie's blackmail from Alice, only a minute after she tells Lou the Council's business is private. The women are convinced Willie is faking, after Nora reminds them that Bea Smith did the same thing earlier (she presumably knows thsi from Barnhurst? ), but when they go to see her in her cell her strange behaviour makes them think again. Julie shows Ann some more duplicate invoices: as she flicks through them we can see that many of them seem to have the signature "Pat Slattery" on them - though they are clearly in the handwriting of at least three different people . Even Lexie is unsettled by Willie's change of character. A work party is assigned to clear up the old print room and reference is made to the printing press being destroyed in the fire. Ann sees Pat about her signatures on the double invoices: she admits she signed them but is offended by the implication that she is responsible for the fraud. Lou takes advantage of Willie's confused state and tells her that it was Nora and May who were responsible for the attack on her. Pat accuses Julie of framing her for the fraud and demands that Joan do something about it as she's the Union rep. May tries to refresh Willie's memory by telling her that her father was a fence: unfortunately Willie no longer knows any criminal slang. Alice reads out a few of the essays from the competition to widespread amusement. Joan is annoyed that Terri has been opening her private mail, even though it's just a letter from Shane. Willie gives her stuff away. May tries to bash Willie to bring her memory back, which makes Willie even more suspicious. Pippa isn't looking forward to a day with Kensai at the zoo. Joan warns Ann that the fraudulent invoices could become a Union matter. May has to face Ann, and is warned to stay away from Willie and to sleep in Nora's dorm. Daphne sees a psychiatric panel, including the lawyer Ben Fulbright, who decides to take on her case and argue for a retrial for her. Joyce heavies Lexie for blackmailing Mervin (or as near to heavying as she can manage). Dr Weissman sees Willie, who preens herself when he reads from her file that she was sent to a Swiss finishing school. Ann goes to the Department to tell Mr Chaucer about the invoices: he tells her that figures are not his strong point but the invoices were not tampered with at his end. As the Minister is determined there must be action, Chaucer tells Ann that he has signed the order for Pat's suspension. Nora hints to Daphne that although she is will be released anyway in a few months, she would help others if she went ahead with her case, like "Jeanie in B block" who is apparently serving an eight year sentence and suffers from PMS. Lou winds Willie up by pretending she's seen May with a carving knife. Pippa overspends on art supplies and charges the rest to her mother's account. Willie barricades herself in her cell. Joan arrives home to a note from Terri that she has a "big surprise" for her . There is a knock on the door and the "surprise" is sprung a little early - it is Terri's parents.